Synchronized Skating is a team sport for figure skaters that involves skating together to create intricate designs, at speed, across the ice. Synchronized skating is a team sport in which 8-20 skaters perform a program together. Teamwork is essential for the team to successfully perform the elements in synchronized skating: blocks, circles, wheels, lines, intersections, moves in the field, moves in isolation, no-hold step sequences, spins and pair moves. This discipline of figure skating is characterized by teamwork, speed, intricate formations and challenging step sequences. Synchronized skating uses the same judging system as singles, pairs and dance. Synchronized skaters become good friends through working, learning and experiencing life together. Since 1999, our teams have been busy as bees making history coast to coast. Our competitive traveling teams have been buzzing across the ice, working hard to achieve our goals and skate our best. We’re not just a team of individual skaters, we’re a dynamic, fun and proud team of motivated skaters! Interested in joining the teams? In 1995, the St. Moritz Ice Skating Club decided that a synchronized team was needed at the Dublin Iceland rink. Laura Erle was asked to teach a summer class. By September of that year, a team was organized and named the Silver Stars Synchronized Skating Team. Silver Stars began its first competitive season in 1996 with its first appearance at the Pacific Coast Sectional Championships and the U.S. National Championships. The following season, the team grew from 12 to 22 skaters and again competed at both Sectionals and Nationals. Over 100 skaters have participated in Silver Stars over the years. We have had skaters from as far away as Finland and France skate with our teams. Our skaters are well-rounded, passing USFSA Moves in the Field, Freestyle, Pairs, and Dance tests. 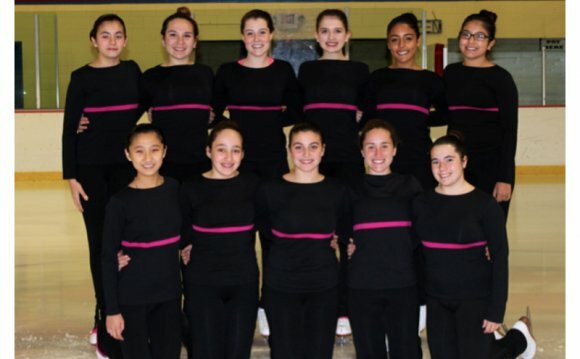 Our skaters also compete in singles, pairs, and dance events in addition to synchro events. Our coaches have always stressed the importance of not only being a well-rounded skater, but a well-rounded person as well. We strive to teach our skaters good sportsmanship, the importance of education, teamwork, respect and responsibility to others. As Silver Stars continues to improve and grow, our success is measured in the accomplishments of our team and its skaters. Silver Stars skaters are encouraged to promote Team Unity on and off the ice by being respectful of one another, helping and encouraging those less skilled, refraining from cliquish behavior, welcoming new team members and being respectful of coaches and parents. At events, the team sits together and promotes good sportsmanship by taking part in cheers for other teams and supporting teammates equally; they keep negative opinions to themselves, and shrug off any inappropriate remarks from other teams. In the process, they help generate good will among all competitors and positive opinions about Silver Stars, the St. Moritz Ice Skating Club and U.S. Fgiure Skating. Silver Stars families also represent the team, St. Moritz and U.S. Figure Skating when attending team events. Our families support our skaters by setting a good example and talking to them about the value of teamwork and sportsmanship. In addition, we carry these values into other settings, such as during online discussions and when visiting other rinks. We also show support by wearing team colors, cheering for the entire team (not individuals) at competitions when appropriate, and creating banners that reflect the team’s goodwill and unity. An integral part of the team experience is the bonding that takes place between the skaters. This is important not only for expanding friendships, but also for promoting trust and unity in preparation for performances. Past activities have included pool parties, movie outings, and team dinners. One fun current team bonding activity is our annual bus ride to the Anaheim competition in November. Our skaters love to have fun together! Winter/Spring Workshops are held February through May on Thursdays. Times to be determined. A try-out may be arranged for the current season up until May 28th by contacting the head coach.